This has been such an idyllic summer. The colors seem more intense, the air seems so clear, and with all of the rain we have had, green rules the landscape! 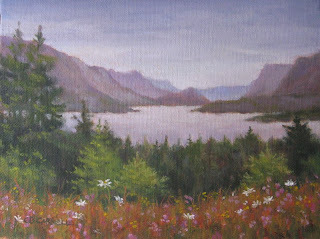 I wonder if I am just appreciating it more because I've been able to spend more time this summer plein air painting? Here's my work from yesterday - bales of hay sitting out among all the different shades of green. 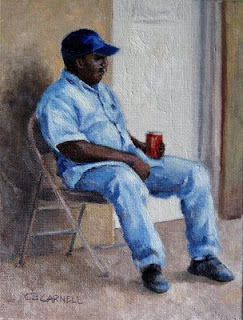 Another great subject to paint for Karin Jurick's Different Strokes From Different Folks Challenge. It was an interesting project in many ways - getting the posture of the gentleman, focusing on values and shapes, working on skin tones. The entries so far have been amazing, and you can see them on Karin's DSFDF Blog . Talk about bliss... 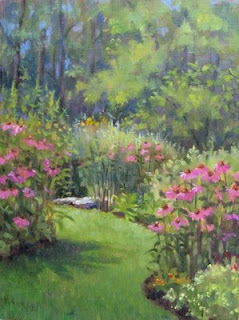 Yesterday I went to the Kings Gap Nature Conservancy to plein air paint in the gardens. The weather was gorgeous, and while I was there I saw hummingbirds flitting through the flowers, frogs and dragonflies in the nymph stage in the pond (which is further on down this path), and a wide variety of bees, butterflies and beetles. My idea of paradise. Just finished this today. If I were to pick a place to sit and rest, and contemplate life - this would be where I would go. This is my entry for the 6/24/09 - 7/8/09 Different Strokes from Different Folks challenge sponsored by artist Karin Jurick. This was a good opportunity to work with water, and a figure. 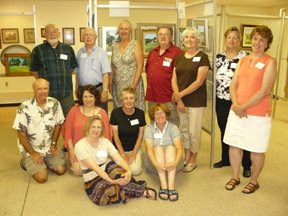 Thanks to Glenn Souders for making sure we got a group photograph taken at the exhibit last Saturday evening. 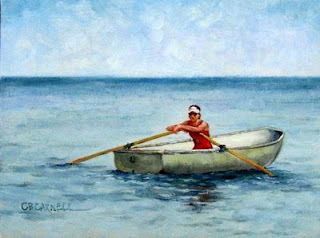 It's a nice reminder of the great time we had painting together! (Not pictured: Susan Gray, Dianne Lorden, Dorothea Barrick and Susan Remmers).